Ulbrich Solar’s Newest PV Ribbon Manufacturing Facility, Supplying Solar Cell Tabbing, Interconnect Wire, and Bus Wire To Solar Module Manufacturers, Achieves ISO 9001:2008 Certification. Ulbrich Solar Technologies, Inc., is pleased to announce that Ulbrich Solar Technologies, Inc., of Hillsboro, Oregon, has successfully passed their ISO 9001:2008 Registration Audit. The Lead Auditor from ABS-QE (ISO 9001 Registrar) has recommended the Oregon facility for registration to the ISO 9001:2008 Standard. There were no non-conformances or observations issued in the final audit report. The auditor recognized the management commitment, continuous improvement activities, quality culture, and a well-documented QMS for effective implementation of USTO Quality System. Achieving ISO certification for our Oregon facility represents an affirmation of our commitment for providing high-quality PV Ribbon products to our customers. It also promotes a culture of quality awareness and continuous improvement at every level in our organization. With this milestone, the team at Ulbrich’s Oregon facility is excited to be a value-added supplier for the Solar Industry, commented Naeem Muhammad, Quality Engineer. Ulbrich Solar Technologies, Inc., is headquartered in Westminster, South Carolina, with locations in Hillsboro, Oregon, and Müllendorf, Austria. Ulbrich Solar is a globally recognized leader in the PV Ribbon Industry and their products include; solar cell tabbing, interconnect wire, bus ribbon, pre-formed/cut bus ribbon, and thin film substrates. Ulbrich also offers LCR (Light-Capturing Ribbon), an innovative ‘grooved’ interconnect wire, that reflects more light onto the surface of a cell, increasing module output by up to 3% over traditional ribbon. Ulbrich Solar Technologies, Inc., was awarded the Top Technology Award by Solarworld AG for excellence in the development of new solder strips and technical support efforts during implementation. The Solarworld award acknowledging Ulbrich Solar’s service and performance was presented to PeterBerghofer, General Manager and Karin Brosch, Manager Sales & Marketing, Ulbrich of Austria. Solarworld recognized Ulbrich’s excellence in developing new soldering strips for solar cells and providing local technical support when these strips were introduced into their manufacturing lines. The awards were presented to only 4 of their 3000+ suppliers and recognized all of the Ulbrich Solar facilities. Ulbrich Solar Technologies boasts three locations, with two in the US and one in Austria. As a world leader in the production of PV Ribbon products for traditional solder, hybrid solder and conductive adhesive technologies, Ulbrich partners with leading Solar Module Manufacturers around the globe to provide state-of-the art module solutions. “Ulbrich has always been on the cutting-edge of PV ribbon technology, with over twenty years of experience in the Industry. Our team of innovators and engineers develop the individualized solutions that today’s module makers require. Our ability to create engineered products tailored to each customer’s specifications and provide on-site technical assistance, proves us invaluable to the top solar module manufacturers for both crystalline silicon and thin film solutions. We are proud to be recognized by Solarworld AG for our partnership and dedication to providing the best PV Ribbon products and service in the Industry,” commented Ed Treglia, Vice President, Ulbrich Solar Technologies, Inc.
Ulbrich Solar Technologies, Inc., is headquartered in Westminster South Carolina. Their products include; solar cell tabbing, interconnect wire, bus ribbon, pre-formed/cut bus ribbon, and thin film substrates. Ulbrich also offers LCR™ (Light-Capturing Ribbon), an innovative ‘grooved’ interconnect wire, that reflects more light onto the surface a cell, increasing output by up to 3% over traditional flat ribbon. Solarworld AG, headquartered in Bonn, Germany, produces and sells solar power solutions, world-wide and can be contacted at http://www.solarworld.de. Ulbrich Solar Technologies, Inc., a world leader in the innovation and production of PV Ribbon products, announces the newest additions to their family of solar cell interconnect wire designed specifically for use with conductive adhesives applications. Easybond-XP™ (silver plated) and EasyBond-SP™ (tin plated) have been created for use with multiple forms of non-solder or hybrid solder technologies including liquid adhesives, pastes, tapes and low melting solder/resins. Easybond™ joins the family high performance PV Ribbon options including the innovative LCR line of’ grooved’ ribbon, recognized for its ability to capture more light than standard ‘smooth’ ribbon. Easybond™ is offered as a value alternative to LCR™ while maintaining critical features such as low yield strengths, tightly controlled camber, precision winding and vacuum packed spools. The new interconnect wire is offered in a variety of copper base alloys and multiple plating options including silver and tin. Easybond™ is produced in thicknesses up to .35mm and 6mm wide and is now available in full production quantities. Ulbrich Solar Technologies, Inc., is headquartered in Westminster, South Carolina. UST offers two facilities in the US and one is Europe. The Ulbrich family of companies has been dedicated for over 20 years to providing highly engineered photovoltaic ribbon including solar cell tabbing, interconnect wire, bus ribbon, and thin film substrates to solar module manufacturers around the globe. Visit us at EU PVSEC, October 1-3, Paris, at booth 1G11 or at Solar Power International, Chicago, October 21-24, at Booth 231. Ulbrich Solar Technologies, Incorporated (UST) is pleased to announce the launch of the new PVRibbon.com. The new website gives a detailed and comprehensive view of Ulbrich Solar’s products and services. UST’s product line used in the manufacture of solar modules includes photovoltaic ribbon for both crystalline silicon and thin film technologies. The new website offers customers extensive product information and datasheets for Solar Cell Tabbing, Bus Wire, Substrates and LCR™. LCR™ is an innovative, grooved interconnect wire that can increase module efficiency by up to 2%. It was developed in conjunction with Emanual Sachs of MIT and is also featured in a two minute video presentation. The website boasts a clean, modern theme designed to be visually pleasing and easy to navigate. In addition to the product- focused content the site offers , a multi-language tool bar offering translations into multiple languages, a glossary of photovoltaic terms, testing information on PV wire, downloads of brochures, as well as company certifications. 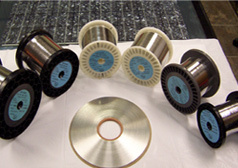 Ulbrich Solar Technologies, Inc., is a spin-off of Ulbrich Stainless Steels and Special Metals, Inc., and its’ products include highly engineered photovoltaic ribbon wire produced in facilities in the US, Asia and Europe. UST is headquartered in Westminster, South Carolina and is an ISO certified company. Ulbrich’s revolutionary Light-Capturing Ribbon™ (LCR), a photovoltaic ribbon product, is produced and sold under a license agreement with 1366 Technologies. The grooved interconnect ribbon’s unique design enables module makers to achieve approximately 2% or more module power output gain. The improved efficiency is achieved by “recapturing” the light that normally leaves the module after striking the surface of standard ribbon. The LCR product began development in 2007. Recent advances in its design and manufacturing have enabled Ulbrich to mass produce and commercialize this leading edge solar ribbon product. Additional advances in the use of conductive films and adhesives as a reliable means of attaching ribbons to cells make LCR a compelling option for module makers. These improvements solve the challenge in attaching the “solder-less” LCR to the solar cell. Ulbrich has also developed the capability to selectively apply solder only on the bottom (flat) side of the ribbon. This capability gives customers the ability to achieve the benefits of LCR while continuing to use solder connections on one side. “We’ve just completed installation of a second LCR production line at our South Carolina facility, and we have plans to expand capacity further to our facilities in Europe and Asia in 2012-2013,” commented Don Hennon, newly appointed Director of Global Sales & Marketing. Ulbrich Solar Technologies, Inc. is headquartered in Westminster, South Carolina. Ulbrich Solar Technologies is dedicated to providing world class photovoltaic ribbon, interconnect wire, bus ribbon and solar tabbing to solar module makers. Photovoltaic Ribbon is Focus of Ulbrich’s New Solar Group — Ulbrich Solar Technologies, Inc.
“We believe this dedicated focus to our PV products will prove beneficial to our customers while allowing us to keep up with the velocity of change in the solar industry,” commented Chris Ulbrich COO. Ulbrich, with over 15 years experience in the solar industry, has been on the leading edge of design, development and distribution of plated precision copper flat wire used for solar cell tabbing, string interconnect ribbon and bus wire, including the new super- efficient Light-Capturing Ribbon™.